Stephen Hyde pulled his badly sprained ankle out of a medical boot, snugged up his cycling shoes, and started down another road to recovery. 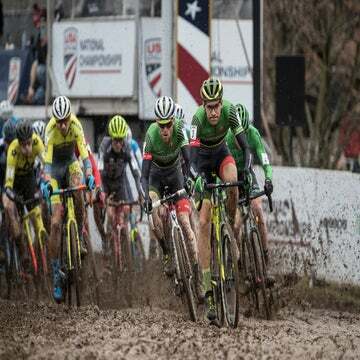 It was just five days after Hyde, the two-time defending U.S. cyclocross champion, had slammed into a concrete staircase during the November 4 Pan-American championships in Ontario. The crash at the Pan-Am Championships left Hyde with dislocated rib cartilage and a mild concussion to go along with the sprained ankle. The painful batch of injuries kept Hyde from racing for four agonizing weeks. During that period he rode mostly indoors as New England’s weather became cold and snowy. Yet as Hyde has always done, he took the setback as a way to reaffirm his commitment and motivation. This was more fuel for the fire. The injuries marked the second major setback for Hyde this season. At the end of September, he broke his sternum in a crash at the World Cup in Waterloo, Wisconsin. After grinding through rehabilitation, the Canadian event was only his second weekend back after the injury. In 2017, Hyde had won the Pan-Am Championships on the heels of four consecutive UCI wins. The victory marked his 13th race of the season at that point. In 2018, by contrast, Hyde had only eight races under his belt by the season’s midpoint, three of which were DNFs. Hyde looked at the chalkboard he uses to chart out his major goals and reassessed his season. So Hyde set up his trainer in the basement of the house he and his fiancée Hayley recently bought in Easthampton, Massachusetts. With snow, ice, and cold weather making outdoor riding impractical, Hyde logged hours indoors. Ordinarily, he would be traveling to races, fitting in training rides where he could. Hyde had to be pragmatic with the unfamiliar routine of indoor riding. Apart from binge-watching TV shows, he also had Hayley for company. She joined him to ride an hour indoors every day, giving him something to look forward to. After a few weeks, Hyde felt his body heal. He went running and did a few rides outdoors in the snow. He planned his return for the NBX Gran Prix in Rhode Island, December 2-3. The comeback couldn’t have gone much better. Hyde won both days, beating his Cannondale teammate Curtis White on Saturday and taking a decisive victory over Kerry Werner (Kona-Shimano) in a muddy race to close out the weekend. The wins were a huge relief for Hyde. 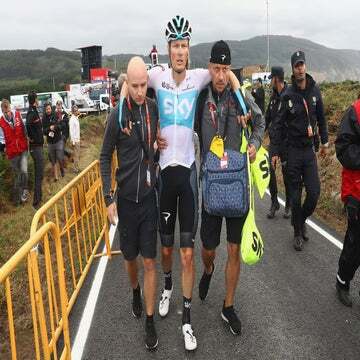 He attributes the barnstorming return to a rehabilitation that encompassed not only his body but also his internal fire to be at the front of the race. Hyde plans to race one more event, the North Carolina Grand Prix, December 8-9, before competing for a third Stars and Stripes jersey in Louisville, Kentucky, December 16. He’s wary of Jeremy Powers’s experience, his ability to handle changing conditions that might occur in Louisville, with its unpredictable rainy conditions. Hyde also points to Werner as one of the best riders in muddy conditions. And another challenge could come from his own teammate, White, who has blossomed into one of the country’s best this fall. Hyde wants a thrilling battle, though, more so than a guaranteed third title.